Regardless of industry or job title, managers cite the same core issues—27 recurring challenges: the superstar whom the manager is afraid of losing, the slacker whom the manager cannot figure out how to motivate, the one with an attitude problem, and the two who cannot get along, to name just a few. It turns out that when things are going wrong in a management relationship, the common denominator is almost always unstructured, low substance, hit-or-miss communication. The real problem is that most managers are “managing on autopilot” without even realizing it—until something goes wrong. And if you are managing on autopilot, then something almost always does. For every workplace problem—even the most awkward and difficult—The 27 Challenges Managers Face shows how to tailor conversations to solve situations familiar to every manager. Tulgan offers clear approaches for turning around bad attitudes, reducing friction and conflict, improving low performers, retaining top performers, and even addressing your own personal burnout. 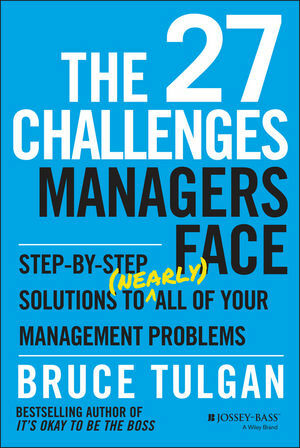 The 27 Challenges Managers Face is an indispensable resource for managers at all levels, one anyone managing anyone will want to keep on hand. One challenge at a time, you’ll see how the most effective managers use the fundamentals of management to proactively resolve (nearly) any problem a manager could face. BRUCE TULGAN is an adviser to business leaders all over the world and a sought-after speaker and seminar leader. He is the founder and CEO of RainmakerThinking, Inc., a management research and training firm, as well as RainmakerThinking.Training, an online training company. Bruce is the author of numerous books, including the bestselling It’s Okay to Be the Boss, the classic Managing Generation X, Not Everyone Gets a Trophy, and It’s Okay to Manage Your Boss. He has written for the New York Times, USA Today, the Harvard Business Review, and Human Resources. He lives in New Haven, Connecticut. —Larry A. Lawson, CEO and president, Spirit AeroSystems, Inc.
—L. Gary Boomer, CEO, Boomer Consulting, Inc.
—Katie Weiser, former global director, training and development, Deloitte Consulting, and CEO, Katie Weiser Coaching. —DJ Zarnick, vice president, human resources, The Henry M. Jackson Foundation for the Advancement of Military Medicine, Inc.
—Andy Lorenzen, senior director, organizational development, Chick-fil-A, Inc.